Chris Pratt was the star of this year's biggest box office hit thus far, with Jurassic World pulling in $651 million domestically, and $1.6 billion worldwide since it's release this past summer. So it may come as somewhat of a shock that, when taken to the heart of New York City, the average citizen failed to recognize him, or identify him. And they certainly couldn't name him. How big of a blow to the ego is that? Maybe it's for the best, as Chris Pratt can still retain some of his anonymity, which is something coveted by most big name celebrities. Sadly, Chris Pratt seems to have a very little name when it comes to being recognized by the average citizen. Nope, he's not Chris Hemsworth or Chris Evans. But he did star in a Marvel movie. That has to account for something, right? 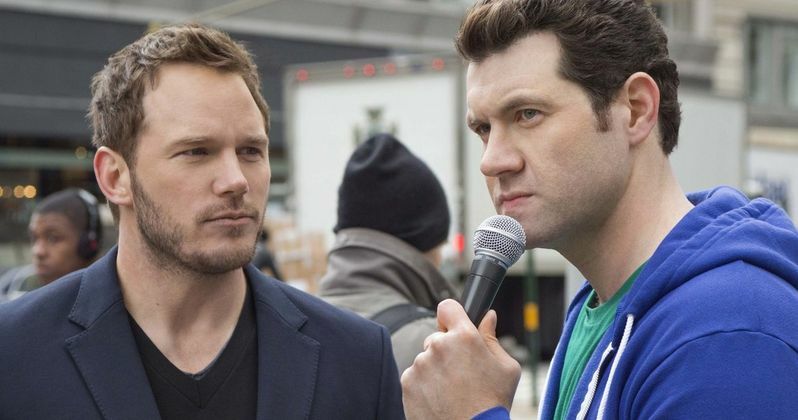 We have the clip from Funny or Die's Billy on the Street, which finds comedian and game show host Billy Eichner taking his pal Chris Pratt out on the streets, where no one really seems to know or care who he is. The two starred in the NBC sitcom Parks and Recreation together, with Billy Eichner joining the ensembles cast in the final two seasons. Billy Eichner poses just one question to those they encounter. He simply asks the following. "Deadline says he's the brightest leading man to come along in years. Who is he?" New Yorkers? They don't know. And they don't care. Which provokes Billy Eichner to jump up and down wildly, as he is prone to do on his show. Pointing at Chris Pratt's strong jawline and winning smile, he is unable to illicit the correct answer. Maybe Disney and Lucasfilm want to think twice before casting him as Dr. Henry Jones Jr. in Indiana Jones 5? One woman explains that she doesn't watch TV. Another mistakes him for the other two Chrises in the Marvel universe. One guy realizes that he is, in fact, an 'actor', But he falls short, wrongly guessing, 'Liam' as his name. Perhaps he was thinking of Chris Hemsworth's brother Liam Hemsworth? The best moment in this clip is when Billy Eichner tells a foreign woman that she is standing in the presence of Josh Duhamel. This causes the lady to jump up and down excitedly, as though she just won the lottery. Of course the good natured Chris Pratt takes it all in stride, always smiling and never seeming too disappointed that not one New Yorker can identify him. He has very little to be sad about. While Jurassic World is the biggest hit of 2015 thus far, he didn't far too poorly in 2014, either. His Marvel sci-fi adventure Guardians of the Galaxy was the #3 movie of last year, and he voiced the main character Emmet in the #5 movie The Lego Movie. He'll next be seen in the 2016 Western remake The Magnificent Seven. And then he has both Guardians of the Galaxy Vol. 2 and Jurassic World 2 lined-up. He certainly isn't hurting for jobs. Perhaps after these next three movies, someone in New York will be able to correctly identify him.